The share of Israel’s population that is elderly is growing rapidly and is expected to continue to do so. How is the country taking care of that generation now, as it reaches old age, and how will it take care of the even larger elderly population expected in the future? The number of elderly Israelis (aged 70 and older) is expected to double from about 610,000 today to about 1.24 million by 2035. As a result, Israel’s disability levels – which are by nature higher among the elderly – are expected to grow even faster than the growth of the general population over the same period of time. This substantial demographic change will increase the demand for long-term care – an issue that has already proven challenging in Israel. Long-term care helps people of all ages who require functional, mental, or social assistance for day-to-day activities. In practice, unsurprisingly, most of the need for long-term care is concentrated in the elderly population. Taub Center findings show that Israel’s long-term care system is inequitable and inefficient compared to developed OECD countries with similar social welfare systems (such as France, Germany, the Netherlands and the United Kingdom). Israel’s spending on long-term care relative to GDP is as high as those countries that have introduced universal long-term care insurance – yet Israel has no such universal insurance. Israel also has a larger percentage of recipients whose long-term care is provided by the community rather than by institutions: about 19% of long-term care is provided by the community in Israel as compared with only 9% for OECD countries. While this is desirable in principle, one possible explanation for this phenomenon is that there are relatively limited options and access to institutional care in Israel. What does all of this mean? In the near future more Israelis will need long-term care and yet our current system is not prepared for this and has many disadvantages. The total amount of money spent on long-term care in Israel – including community care, institutional care, and premiums on long-term care insurance – is estimated at NIS 15.3 billion in 2014. Yet the government only covers a little over half, or NIS 8.3 billion, of this spending. Total private financing, by comparison, is estimated at 7.3 billion NIS (2014). 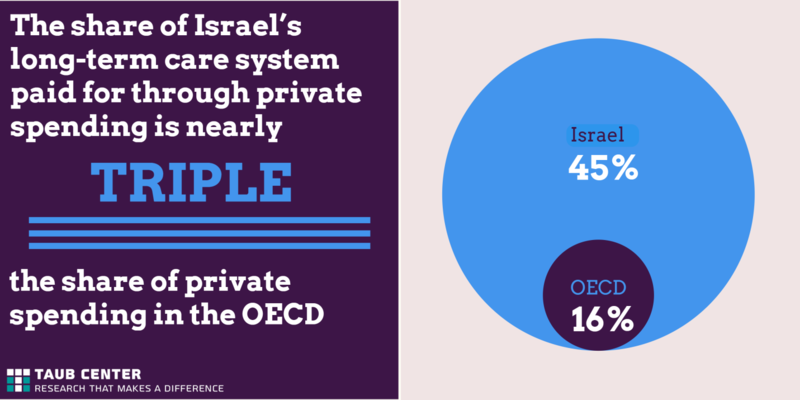 Private funding of long-term care in Israel is three times higher than the OECD average (45% as compared with 16%). Most of this private care is home-based. The money that households spend on long-term care is divided among a number of different areas: about 39% of household spending on long-term care goes to payment for caregivers (often foreign workers), about 37% goes to assisted living facilities, and about 22% goes toward insurance premiums. Public funding, regulation and oversight for long-term care is divided among the National Insurance Institute, the Ministry of Health, the Ministry of Social Services, and the kupot holim (health funds). This fragmentation contributes to inefficiencies in the public system. Thus, the burden of long-term care falls heavily on the elderly and their families. This burden is financial, physical and emotional, in part because of the difficulty of navigating the relevant bureaucracy. Moreover, in many instances family members have to scale back or quit work in order to care for their aging parents. Most pressed are middle class households who, on the one hand, cannot afford to hire caregivers or afford privately funded assisted living facilities, and on the other hand are not poor enough to qualify for state supported institutional care. Taub Center data show that nearly all countries with social welfare systems similar to that of Israel provide long-term care through publicly-oriented solutions, such as combining compulsory insurance payments with public funding, rather than relying so heavily on private spending, in order to provide universal long-term care options to their citizens. • Establish a universal basic basket of long-term care services that is separate from the medical care basket. residents. Raising the retirement age presents another opportunity to ease the level of funding required by the government. • Allow residents to buy private discretionary long-term care insurance to supplement their public entitlement under universal coverage. 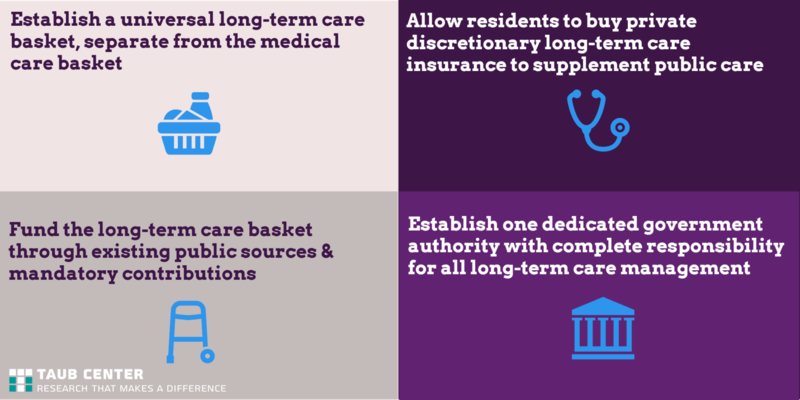 • Establish a single, dedicated government authority that has complete responsibility for all long-term care management, rather than the current segmented system. These policy options would reduce the burden on families, increase public responsibility, and make the system more equal and efficient. Prioritizing reforms to the system now can ensure that Israel is better prepared to care for its growing elderly population.